Mr. Jardine’s practice has focused for 35 years on prosecuting and defending commercial litigation matters, and emphasizes complex business, antitrust, securities and intellectual property litigation frequently in class-action settings. He served for 18 years as the Managing Director of Ray Quinney & Nebeker, where he continues his litigation practice. In 1977-1978, Mr. Jardine was Special Assistant to the Attorney General of the United States Griffin Bell. Mr. Jardine is a member of the American College of Trial Lawyers, a former member of the Committee on the Local Rules of Practice for the District of Utah and former Chairman of the Litigation Section of the Utah State Bar. 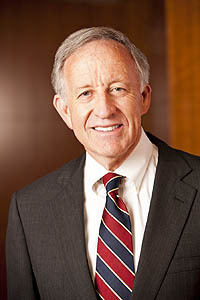 He has been involved in a wide variety of community activities, including serving as Outside Counsel to the Salt Lake Olympic Organizing Committee, as a member of the Board of Regents of the Utah System of Higher Education, as Chairman of the Board of Trustees of the University of Utah and as a Governor of the Salt Lake Area Chamber of Commerce. Mr. Jardine was named Outstanding Lawyer of the Year by the Utah Chapter of the Federal Bar Association for 2006. He was selected by the Utah Bar Commission as the recipient of the Bar’s Distinguished Lawyer of the Year award for 2005. Mr. Jardine is recognized in Chambers USA in Litigation: General Commercial (Band 1). For nearly twenty years Mr. Jardine has been included on the list of The Best Lawyers in America in Antitrust Law, Commercial Litigation, and Bet-the-Company Litigation. He has been twice recognized by Best Lawyers as Lawyer of the Year in Bet-the-Company Litigation (2014) and Antitrust Law (2010). He has also been selected for inclusion in Mountain States Super Lawyers (2007-2009, 2011-2014) in the categories of Antitrust and Business Litigation. He was named as one of the Top 10, a list of attorneys who received the highest point totals in the Utah nomination, research and blue ribbon review process for Mountain States Super Lawyers.